In an appellation where many growers have vines more than 100 years old, Domaine Roger Perrin is on the young side as it was formed in 1969 by Roger Perrin. However, the vineyards were in existence before that as they date back to about the start of the 20th century. The Southern Rhone Valley property changed names in 1969 after the father in law of Roger Perrin chose to retire. In 1986, things changed again when Luc Perrin took over managing the property after Roger Perrin passed away during the harvest of 1986. Sadly, Luc Perrin passed away in 2010 at only 45 years of age. Veronique Perrin is in charge of Domaine Roger Perrin today. Domaine Roger Perrin has 15.63 hectares of vines in the Chateauneuf du Pape appellation. 13.6 hectares are devoted to making red Chateauneuf du Pape wine and 2 hectares are used for growing grapes to make white Chateauneuf du Pape wine. The terroir ranges from stone and gravel to sand and limestone soils. The vineyards are divided into 61 separate parcels that are dispersed in different lieux-dits in Chateauneuf du Pape. Most of their vines are planted in two different soil types, rocks and stones over clay and limestone and they have also sandy soils as well. The average of their vines is more than 60 years of age, with some vines being more than 100 years old. The best vintages of Domaine Roger Perrin are: 2018, 2017, 2016, 2015, 2012, 2010, 2009, 2007, 2005, 2001, 2000 and 1998. Domaine Roger Perrin produces 2 red Chateauneuf du Pape wines and 1 Chateauneuf du Pape Blanc. Domaine Roger Perrin Chateauneuf du Pape is a blend that is usually close to 76% Grenache, 12% Syrah, 7% Mourvedre, 3% Cinsault, 2% Clairette, 2% Counoise, and 2% Vaccarese. However, depending on the vintage, that blend can vary to some degree. The terroir is rocks, stones, sand and limestone soils. The vines are planted in the la Bertaude, Bois Lauzon, Cabrieres and Chapouin lieux-dits. Between 30% to 40% of the grapes are destemmed. Vinification takes place in traditional cement vats, foudres, used oak barrels and 15% new, French oak barrels for an average of 15 months before bottling. The production hovers at close to 4,200 cases per year. Domaine Roger Perrin Reserve Vieilles Vignes – Made from a blend of 70% Grenache, 20% Syrah and 10% Mourvedre. Although Cinsault can also be used in the blend. The grapes used for the Vieiles Vignes are from a parcel selection of the estates oldest vines. The terroir is in sand and rock soils. Much of the Grenache used in this cuvee are from vines over 100 years of age. The vines are planted in the la Berthaude, Cabrieres and Chapouin lieux-dits. The wine is aged in a combination of 30% new French oak barrels, and older oak casks for about 12 months. Only 650 cases are produced each vintage. Domaine Roger Perrin Chateauneuf du Pape Blanc – From a blend of 50% Grenache Blanc, 25% Clairette, 20% Roussanne and 5% Bourboulenc, the fruit source for this wine comes from some of the oldest white wine vines in the appellation as they were planted all the way back in 1921! The wine is aged in a combination of steel tank and new, French oak barrels for 6 to 7 months before bottling. The production is close to 650 cases per year. Domaine Roger Perrin can be enjoyed on the young side with decanting of 1 hour or so. This allows the wine to soften and open its perfume. Older vintages might need very little decanting, just enough to remove the sediment. Domaine Roger Perrin is usually better with 3-4 years of bottle age. Of course that can vary slightly, depending on the vintage. In the best vintages the wine should be consumed within 4-14 years after the vintage. Domaine Roger Perrin is best served at 15.5 degrees Celsius, 60 degrees Fahrenheit. The cool, almost cellar temperature gives the wine more freshness and lift. Domaine Roger Perrin is best served with all types of classic meat dishes, veal, pork, beef, lamb, duck, game, roast chicken, roasted, braised, stewed dishes, sausage, grilled meats, barbecue and cassoulet. Domaine Roger Perrin is also good with Asian dishes, hearty fish courses like tuna, mushrooms, cheese, pasta, eggplant and tomatoes. The white wine of Domaine Roger Perrin is best served with a myriad of different seafood dishes, shellfish, crab, lobster, sushi, sashimi, chicken, pork and veal, as well as Asian cuisine. 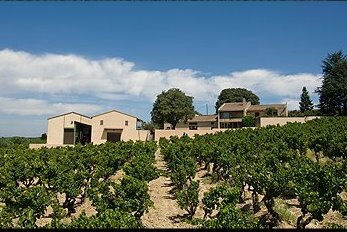 Domaine Roger Perrin also owns 25.6 hectares in the Cotes du Rhone appellation which are used to produce red, white and rose’ wine. They also own another 6.38 hectares of vines classified as Vin de Pays. Silky, rich, fresh and pure, the wine has lift, sensuality and depth of character, with all its perfectly ripe, red fruits, spice and herbal personality. The wine is made from 70% Grenache, 20% Syrah and 10% Mourvedre. Herbs and flowers pair well with the generous kirsch, licorice and cherry notes. Long, silky and polished. The wine is made from 70% Grenache, 15% Mourvedre, 10% Syrah and other varieties.. Medium bodied, silky, round, soft and polished, there is a hint of oak, but there is far too much ripe, sweet, juicy red fruits, to care. Forward and already charming, this is quite nice. The wine was made from blending 70% Grenache, 15% Mourvedre, 3% Cinsault and 2% Clairette. Floral in character, with layers of supple textured, sensuous fruit, the wine is richly textured, soft, polished, fresh and long. This is really great stuff. The wine is made from 80% Grenache and 20% Syrah. Elegant, soft, stony and fresh, there is a nice salty quality to the tannins which adds to the sweet red fruits in the elegantly textured wine. The wine is made from 80% Grenache and 20%..
Fresh, bright, herb tinged fruits, a medium body and a blast of freshly picked, ripe, sweet, red berries and earthy garrigue notes are what you're going to find here. Medium bodied, juicy red fruits, with a sweetness and fresh quality start the wine off. This is on the lean, bright side of the style range, with a crispness in the herb tinged finish. Medium bodied, early drinking, soft, forward, spicy kirsch filled wine that is fully open for business today. Fresh, soft, sweet, kirsch and plum notes move to a soft, forward, slightly drying, medium bodied, red berry finish. The wine was made from a blend of 75% Grenache, 17% Syrah and 8% Mourvedre. Sweet, spicy kirsch, licorice and a hint of toast in the nose, medium bodied, with a forward, silky, cherry nice in the elegant finish. Medium bodied, soft and polished, with sweet, red cherries, kirsch, thyme, espresso, smoke and licorice on the nose. On the palate, the wine is silky, finishing with kirsch, licorice and coffee bean. This will be even better once the oak better integrates with the wine. The wine was made from a blend of 75% old vine Grenache, 17% Syrah and 8% Mourvedre. Medium bodied, forward, soft, silky and easy to drink, with its sweet, black raspberry, cherry, spice, earth and vanilla personality. The wine is modern styled, but quite tasty and fresh. From a blend dominated by old vine Grenache, the wine is filled with espresso bean, black raspberry, thyme and fresh herbs. Medium bodied, soft, round and forward, there is an oaky, vanilla quality to the raspberry, cherry tinged finish that is going to make some people happier than others. This was firing on all cylinders. Earth, garrigue, rocks, kirsch liqueur and peppery notes kept you busy. The wine was fresh, plush and richly concentrated with sweet, ripe, juicy fruits. Very sensuous in texture. Modern in style, with layers of ripe, jammy cherries, kirsch, garrigue and strawberry jam, the wine is sweet, supple and delicious. With a nose filled with pepper, kirsch, Provencal herbs, strawberry and spice, this rich, full bodied, generous, lush style of Chateaunef du Pape fills your mouth with flavor. The wine ends with a blast of fresh, ripe, round textured, black raspberry and dark cherry fruit. This is drinking perfectly at the moment. With aromas packed with sweet red fruits, jam, earth, spice box, garrigue and pepper, this supple textured, modern styled, medium bodied, Chateauneuf du Pape wine is fully mature. I'd opt for drinkning it over the next 2-5 years.